Ahh the last six on Saturday before Christmas, I hope you have got all your presents brought and wrapped ready for the big day? Enjoyed my last few days at work, got a few things finished off, Plants planted, bulbs well finished (apart the last few for home, 150 is just a few isn’t) and now ready for Christmas. 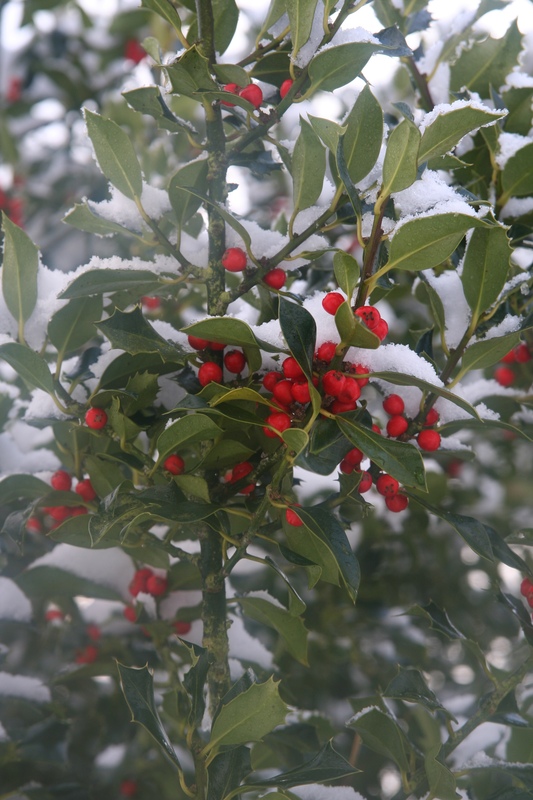 Now talking about the big C, I spent a while thinking about what to do for the Six this Saturday, wanted to do something different, so here’s the 6 on Saturday featuring 6 Plants that help to make Christmas a special time of year for us! Ahh where would we be without mistletoe at Christmas, no renditions of Cliff Richards Mistletoe and wine or no where to kiss under for a start! Mistletoe has been used for thousands of years, druids rated mistletoe as one of their most sacred of all plants for its mystic powers some of which ward off evil spirits from our homes. It is thought the Vikings are the first people to start the tradition of kissing under the mistletoe. Again another British native plant and one that’s got its roots firmly in our ancient history. Thought to ward off evil spirts and have been planted around churchyards for that reason or the churches were build near old yew trees to fit in to the old beliefs maybe. Yew trees are also the first Christmas trees here in the uk, brought over from Germany by Queen Charlotte when she married king George around 1800. What more can I say about this beautiful plant, we need some flowers at this time of the year and these are just so beautiful! I hope you enjoyed my Christmas 6 on Saturday! It’s a little different from my normal one and I have cheated and used photos from my library, just hoping I won’t get sent to the naughty step for 44minutes by the propagator. Next post: Plant of the year! What a lovely combo for this week’s Six. If Mr P had put you on the step (but he’s too sensible for that), we would all join you for more stories. The photos are so evocative of this time of year, regardless when they were taken. Did you see/have you seen the great old yew featured in the Judy Dench thing on trees, then the recovered yew long bows from Henry VIII’s battleship? Marvelous, marvelous things, yews, in all seasons. Thanks so much for this post! What a great post! Lovely photos as always and so perfectly seasonal. Have a great Christmas. Great post! It’s plain to see the thought and care that went into it. There is a native yew here, far from any of its relatives. The fruits look like those in your picture, but are a deep red. They look so weird. Even though it is a native specie, it is very rare. Funny enough this one is the very rare yellow form that’s not often seen here in the uk, I think there’s only a few trees about normally red as well but I thought I would add something different, is it t. Canadanesis or brevifolia that grows near you? Taxus brevifolia lives on the west coast as far south as Sonoma County. Although their commonly accepted range maps indicate that they are not native any farther south, there are a few very small colonies of them in the Santa Cruz Mountains. I have never seen them, but I have seen specimens that were obtained from those colonies. They were quite trendy back when I was in school, although I never understood why. They are not particularly attractive. Other yews are better. Yes, it is open and can be rather grungy looking. English and Irish yews grow at Filoli in Woodside. They are much more refined. I know that they are garden cultivars, but they are impressive nonetheless. I remember yews in our yard growing up, such pretty berries! I was reading down the comments waiting for someone to remark on it being a yellow fruited yew. And not any old pine either but a classy parviflora form. Classy post in every way. A nice festive six, Thomas. My Hellebores are all Lenten Roses. I’ve never been able to successfully grow the Christmas-flowering ones. Can’t see why. I’m also strangely holly berry-less this year. I’ll have to paint some peas and find the super-glue ;). Have a great Christmas. Great choices for a Christmas Six in Saturday, even though I’ll now have “The Holly and the Ivy” running through my head for the rest of the day.